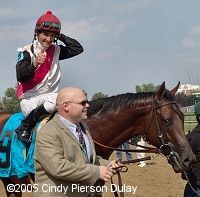 Robby Albarado celebrates his win in the Woodford Reserve Turf Classic aboard America Alive. 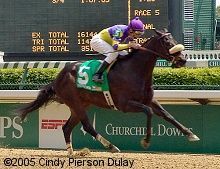 There is more than just one big race at Churchill Downs on Derby Day. The undercard features the other divisions of racing, and for most of the entrants kick off campaigns that may lead to a trip to Belmont Park for the Breeders' Cup at the end of October. Here are the results for all five in the order they were run. Kentucky Derby results are here. 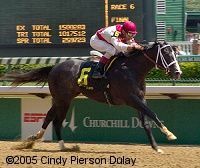 The first stakes race on the afternoon was the $200,000 Churchill Downs Handicap, a Grade 2 sprint for older horses over 7 furlongs on the main track. 17-1 shot Battle Won stalked the early pace of 13-1 longshot Tricky Trevor, took command at the 3/16 pole and drew away to win by 3 1/2 lengths over 50-1 longshot Level Playingfield in a time of 1:20.56. It was 1/2 a length back to 7-2 favorite Pomeroy in third. Winning trainer Charles Simon said, "Numbers-wise, he stacked up with these, and I told the owner 'Let's go for the big one.' I think 7/8 is his best distance, and when we bought him (last year for $150,000) it was as a dirt horse. But he can run on either turf or dirt. I love to win on Derby Day, and this is my first grade 2 win, so I'm really thrilled." The $100,000 Three Chimneys Juvenile featured 2-year-olds mostly making their stakes debuts in a 5 furlong sprint on the main track. 1-2 favorite Half Ours grabbed the lead 3 furlongs from the start, and widened his lead through the lane to win by 4 1/4 lengths over 20-1 longshot Five Star Holding in 57.07. It was another 3/4 length back to 9-2 third choice Beacon Shine. Winning trainer Todd Pletcher said, "He ran so fast at Keeneland (in his debut), I was just shocked watching the race how easily he won. It shows you how talented he is. The first couple of times I breezed this colt it was like, 'Wow, this colt can really run and we're not asking him to do anything.' 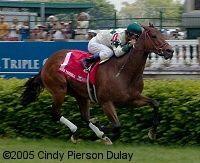 We went to Keeneland with the idea to run him and he ran so well, it made a lot of sense to come back here." The action moved to the lawn in the $100,000 Comp USA Turf Mile, a Grade 3 event for fillies and mares at a mile on the turf course. 5-1 shot Miss Terrible and 7-2 second choice Sand Springs raced in tandem the whole way around, and finished a length apart with Miss Terrible in front in 1:35.89. 3-1 favorite Warning Zone finished fifth. Winning trainer Brad Ross said, "She's a champion, and champions run anywhere. She took control of the race and that was it. My family and I have such a special relationship with her. She screams every time I enter the barn. She's like my daughter." 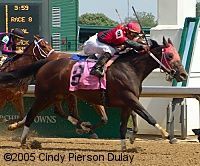 The first of three Grade 1 events on the afternoon was the $250,000 Humana Distaff Handicap for older fillies and mares sprinting 7 furlongs on the main track. 10-1 shot My Trusty Cat settled in mid-pack down the backstretch, then came out four wide around the turn and closed strongly through the lane to get by up 3/4 length in 1:21.18 over 13-1 shot Molto Vita. 2-5 favorite Madcap Escapade was loose on the lead early but tired through the stretch and finished fifth. 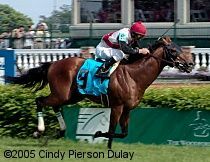 Winning trainer David Vance said, "That's the only thing that's kept this mare in training, to try to get a Grade 1 with her and try to get over a million dollars. We came so close at Saratoga when Lady Tak beat her a head. If she had won, she probably wouldn't have been racing this year. With [Madcap Escapade] you're always going to have pace to run at her, there's no other way around it," Vance said. "You just hope that you're good enough to catch her." The Grade 1 Woodford Reserve Turf Classic featured older horses going 1 1/8 miles on the turf course for a $400,000 purse. 18-1 longshot America Alive trailed the field for the first six furlongs, then jockey Robby Albarado asked him for run around the turn and got it, as he charged strongly through the lane to prevail by 1 3/4 lengths over 7-2 second choice Meteor Storm in 1:47.34. 3-1 favorite Perfect Drift suffered traffic trouble around the turn and tired badly through the stretch, finishing ninth. Winning jockey Robby Albarado said, ?I never had to check the horse once. When you?re that far back, you don?t see many horses. I saved ground on the turn and he was moving exceptionally well. Trainer Neil Howard added, ?We knew we were taking a shot here, raising the bar a little. We took this chance because of how well he was training.